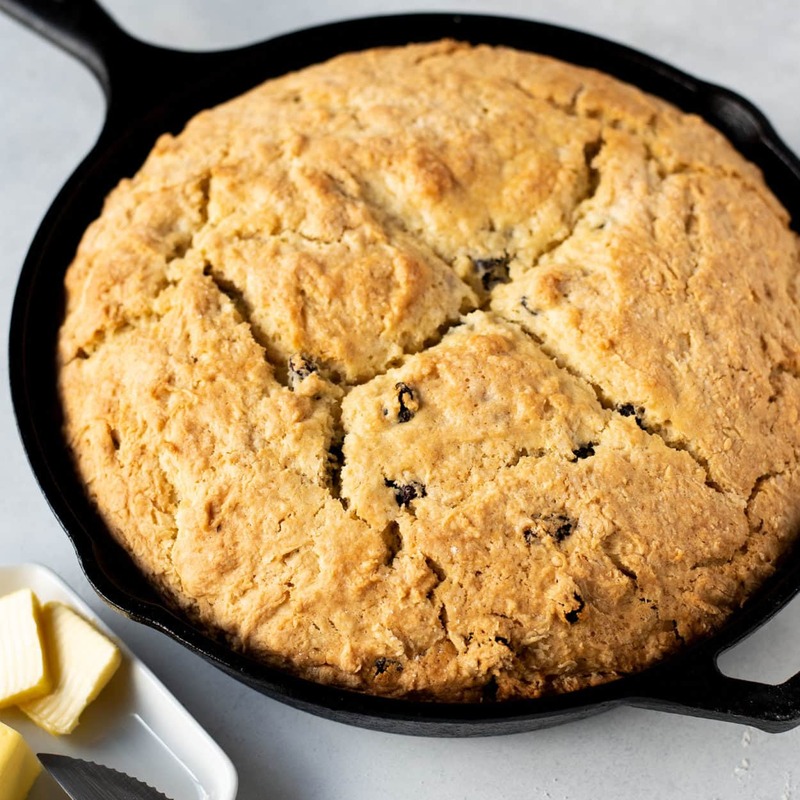 Irish bread or Irish soda bread, has been a Saint Paddy’s Day tradition in Patty’s family for decades. You could say it was their very tightly kept family recipe passed down from their 100% Irish, Nana. So tightly kept that this isn’t even Nana’s exact recipe because she kept her cards close to the vest, which I can appreciate. 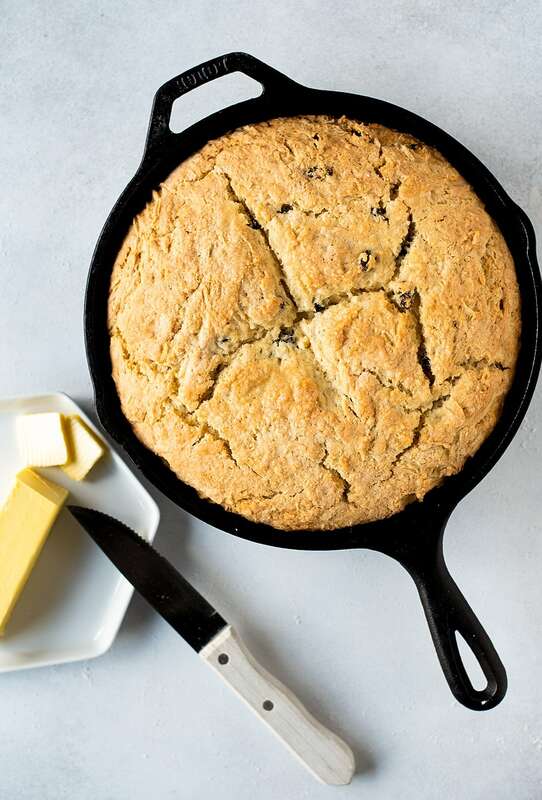 This recipe is what Patty’s mom has been making for years, which I’m told is a tad sweeter than your typical Irish bread. This is where I come in. Before I met Patty, I was never much of a fan of Irish bread. It can be dry, crumbly, and bland if it’s made incorrectly. 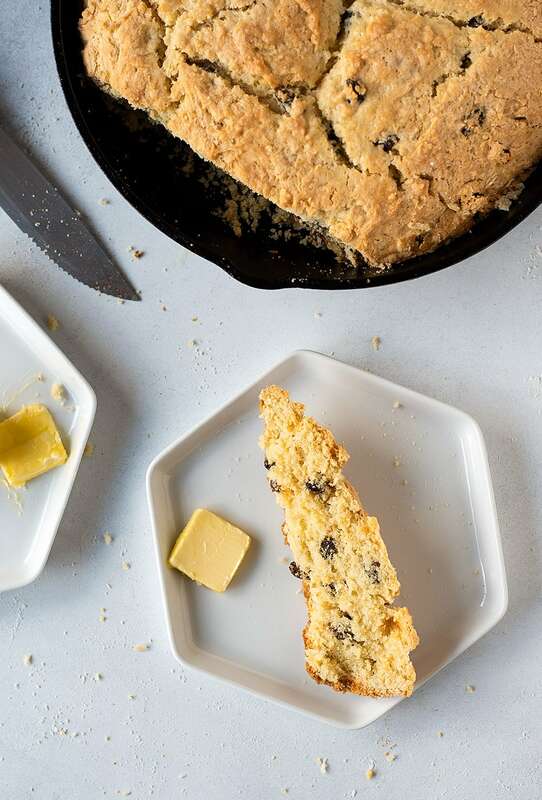 Patty changed everything I thought I knew about Irish bread. Served slightly warm, spread with room temp butter, it’s the most delicious Irish bread I’ve ever had. It’s not overly sweet, but sweet enough to make you forget about Irish bread ever being bland or tasteless. 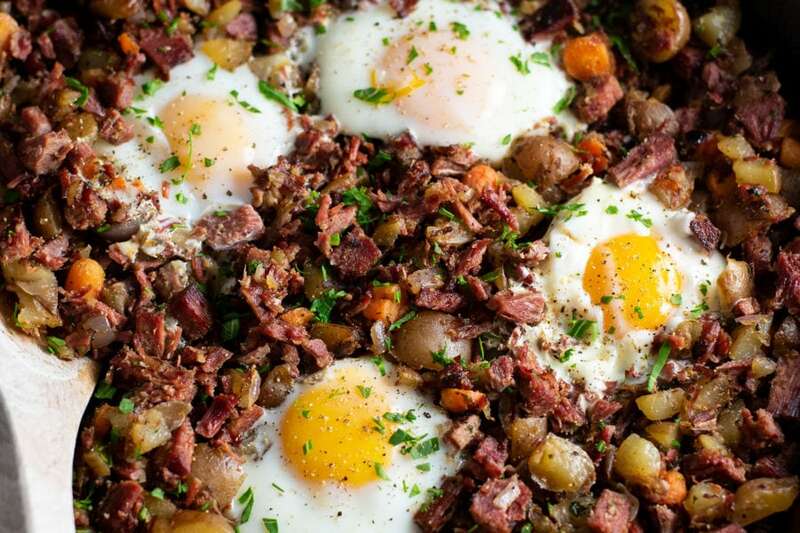 I could skip everything else and just eat this on Saint Paddy’s Day. Thank you, Patty for making this! Soak raisins in a small bowl with a splash of rum or Irish whiskey, set aside. Mix together sugar, baking powder, flour and salt in a large bowl. Slice butter and work into dry ingredients with a spoon (do not melt butter). Add strained raisins and mix well. Mixture should crumbly. Make a hole in the center of the mixture and add eggs and milk. Stir with a butter knife until the mixture forms a ball and leaves the sides of the bowl. Toss onto a well-floured surface and with floured hands, knead slightly until soft ball is formed. 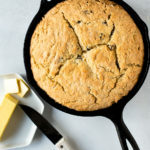 Place in a greased 9-10 inch cast iron skillet. Make a cross on the top of the loaf and brush with milk or beaten egg for extra shininess. Sprinkle top with sugar and bake at 375 °F for 10 minutes, then at 350 °F for 25-30 additional minutes. It’s done when golden brown on the top and toothpick comes out clean. Serve warm with butter and a cold Guinness. The dough can be divided into two equal loaves and alternatively baked on a greased baking sheet, baked the same way.